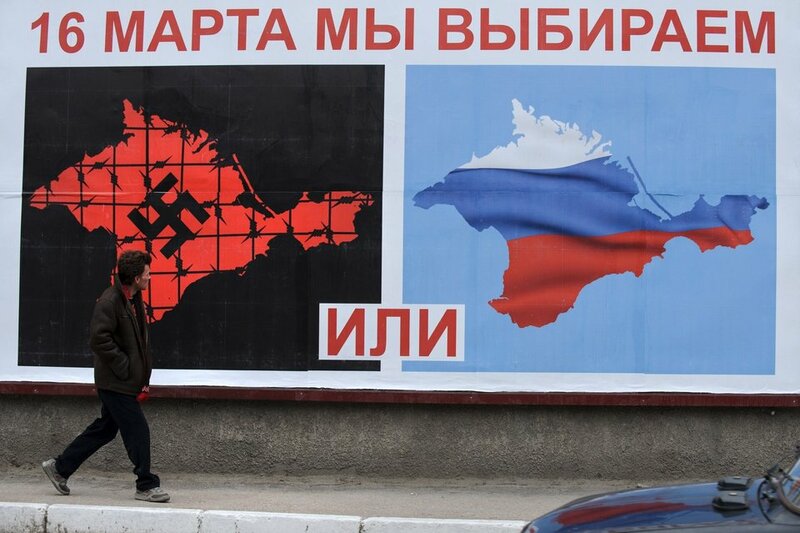 As the focus of recent events has turned to the Crimean peninsula in the south and the eastern provinces of Ukraine, part of a narrative being spun to justify the assimilation is that Russians or Russian speakers in the East are under grave threat from violent, neo-Nazi fascist extremists from Kyiv and the West. 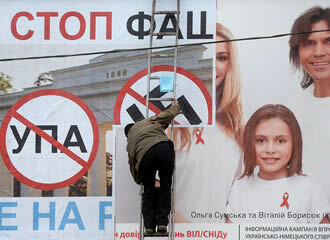 Anti-Kyiv billboard… being plastered over an AIDS awareness advert. It is the expansion of the eastward-creeping terror of the lawless thugs who drove out the elected government by force, replacing them with fellow radical extremists. I was privileged to spend time on Maidan as January moved into February… after the initiation of violent confrontation on Hrushevskogo Street (literally around the corner from the center of Maidan) and the first few tragic deaths of protesters and before the horrendous mass deaths (many of which, though far from all, were from sniper fire) which presaged the flight of the former president and much of his coterie. Because I did not feel comfortable being in such a place as a “tourist” I did not bring my camera. 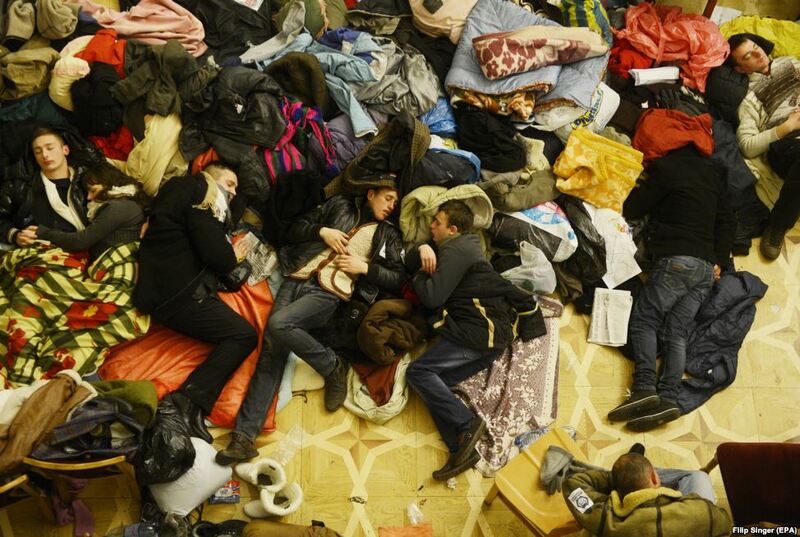 However, fortunately, I found a wonderful piece of photojournalism on Maidan that was done right around that same time which I highly recommend: Anatomy of Maidan. Virtual tour of the protester’s grounds. It will illustrate just about everything I managed to see. The barricades were truly impressive. However, it seemed incongruous to enter into the middle of the square, directly in front of the main platform, through one of the normal exits from the subway. True, certain other exits were blocked off crudely but effectively with lumber and barbed wire (with a frosting of ice on the stairs), there was still, literally “nothing stopping” me (or any other willing person) from strolling unmolested into the center of the action. There were what I’d describe as “bands of militia” present sufficient to keep order, but not in any way intimidating. Most were armed with clubs reminiscent of the handle which broke off my wheelbarrow recently. If any were packing heat, it wasn’t evident. There was no evidence of either heavy-handed thuggery nor anarchy. I did see one of the “brigades” hustling a heavy-set guy in camos and a buzz hair-cut down Khreshchatyk, the city’s main street. The man had “THIEF” painted on his forehead with the green disinfectant that they put on wounds all the time that school yard kids know so well. He was basically shown the gate down at the end of the barricades where the Lenin statue once stood. But it seemed to be a quite orderly and just, and certainly colorful, procedure. These guys were armed, but not dangerous. Down at that far end of the main drag was a mock cell, with a ghoulish effigy chained inside, with a banner over it reading (in English) “Yanukovich – Killer.” There always seems to be an element of street theater in most everything – even the most deadly serious things – that Ukrainians engage from the heart. One of the bones of contention in all discussion had been occupied buildings. Many pro-Russians urged a crackdown, pointing out that America would never tolerate this sort of rampant lawlessness in their capital. Wasn’t it an outrage that they took over government buildings, places where the people’s business is transacted? Well, the problem is that these folks had become convinced (with ten year’s hard evidence to back it up) that the “people’s business” had been long set aside while the mafia clan pulling most of the strings took care of their business, which was bleeding the economy of the country white. Once the same “gang” seemed to declare war on its own people (by acts of violence against students, the press, etc. and criminalizing the entire protest movement and its apparatus in one fell swoop, see ), it seemed to make sense that buildings such as City Hall (which hadn’t seen an independent, healthy, functional, locally accountable administration in who-knows-how-long, if ever) be repurposed. There was the same sort of crude but effective, lumber and razor-wire stuff around the stairway into City Hall… obviously they wanted to be able to keep people out, if and when they needed to. I had no problem strolling right in without a second glance. The place was amazing, cluttered, though clean. Stickers, placards, handwritten notes and fancy banners were everywhere. But, in the broader sense, there was a sense and rhythm to the space. There were collecting points for medicines – I saw a few couples bringing small bags to the table, which was right next to something of a “people’s pharmacy” which seemed to operate quite effectively. They certainly did “brisk business,” though I never saw any money changing hands. All of the political parties, student groups, agitators and revolutionaries that seemed to have so many people so scared were all gathered around makeshift tables, with no apparent pecking order. Some of the “bigger-named” groups just had a pile of boxes in a corner, while some folks I’d never heard of got a really nice bit of furniture with a little counter with a window and everything. But everyone seemed to be going about whatever they were doing, whether “business” or snoozing, paging through local political newspapers, or talking at length about what in God’s name was going on. I have been in many far scarier places. But this place – which seemed to be in a no-go, stay-away, Danger-Will-Robinson sort of place for most of my American friends – seemed not frightening in the least. Fear was not a factor here… not of the uncertainty of the situation, nor of these people who many feared were either already or on the brink of being out of control, nor even of the government who in a matter of days would order a rain of blows and bullets that would leave a hundred dead. The spirit in City Hall that day was getting done what had to be done. There was lively conversation about what-all that entailed. For some it was sleep. For others it was something else. But there were things – lots of things – that needed to get done so that people could stay en masse on Maidan as long as it would take for justice to bring the people a cure for the wasting disease of corruption that they were no longer going to tolerate. And, by God, they were getting done because these Ukrainians are willing to do whatever it takes with whatever is at hand… in this case, it just happened to be a government building.